It’s been a year since I’ve post my last recipe. Since then a lot of thing have changed in my life. I graduated from a master degree in Clinical Psychology and I’ve got married!!! Over this year also my attitude on food as changed. I am trying to eat more healthy, and I can’t wait to share my attempt with all of you. 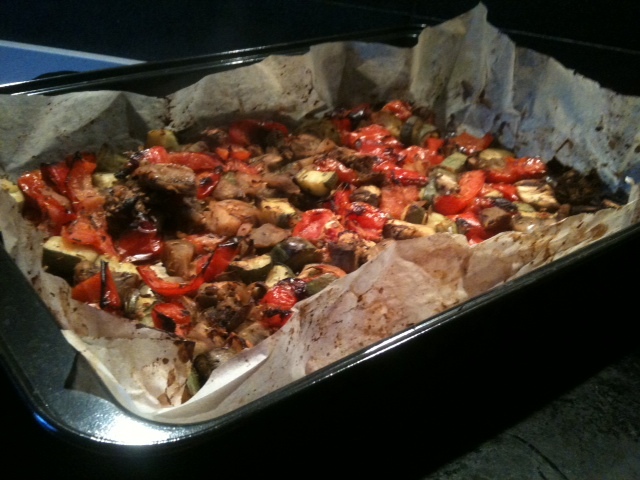 Yesterday I’ve made this delicious veggie casserole, oil free, butter free…. just vegetables! I’ve just cut the vegetables into chunks and put in a casserole that I’ve covered with parchment paper. I’ve sprinkled mixed herbs, salt and pepper and put into the oven for just 30 minutes + 10 minutes of broiler function. That’s it! Mmm I love roast cherry tomatoes! Sounds good.